This what you get in a society where government doesn’t make deliberate efforts to rescue the vulnerable. 24yrs old Sherifat Bakare, is a young lady one could describe at first glance as pretty. But as she sat on the ground in front of the Special Anti-Robbery Squad of the Ogun State Police Command in Abeokuta, one cannot but imagine how deadly she might have been on operations with her robbery gang. “I was hustling before Raji, my boyfriend, told me to join his gang,” Bakare began. But When she was asked to elaborate on what she did as a “hustler,” she explained that she meant prostitution. Bakare in company with four other members of her gang, were apprehended on Wednesday, May 21, 2014 by the men of Ogun State SARS, who had been on their trail after receiving a tip-off about the gang’s plan. It all began a few weeks ago, Bakare narrated. 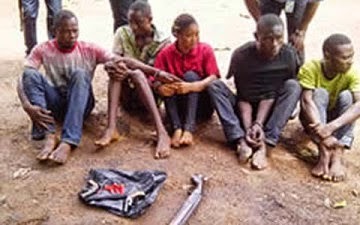 She said another member of the gang, Bola Onasile, (also in SARS custody) had approached her boyfriend about the availability of N70m in a wealthy man’s house in Joju area of Sango, Ogun State. Asked how much she was promised out of the N70m they were going to steal, Bakare said whatever went to her late boyfriend would have accrued to her as well. The young lady said she learnt photography when she dropped out of secondary school but had not been able to practise the trade because she did not think she could make much money from it. During Punch’s visit to the SARS office in Abeokuta, 36-year-old Onasile, who brought the N70m job, was in a way evasive when asked how he knew about the money. He later said that an acquaintance of his, a man named Tunde, informed him about the money. Onasile said he was a revenue collector for a local government council in Lagos before he lost the job when a new chairman weeded out excess employees from the council.